The guide looks at various different factors including pay, benefits, work-life balance and corporate culture and is compiled through detailed questionnaires completed by staff members. James Stafford, Studio71 UK Managing Director, was interviewed by Broadcast during the selection process about Studio71’s working philosophy including encouraging staff development and satisfaction and the importance of diversity within business – read the article here. Broadcast is a leading British platform covering industry news and insights, consisting of a weekly printed magazine, online platform, app and database. 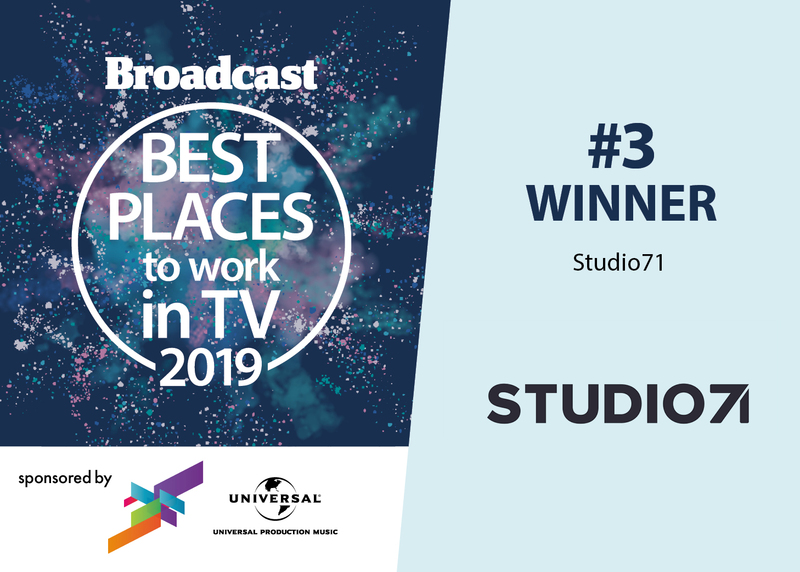 The ‘Best Places to Work in TV’ awards programme recognises the best employers in TV production, post-production, distribution and broadcasting. Previous winners include Knickerbockerglory TV and A+E Networks. You can view the full ‘Best Places to Work in TV 2019’ list and the other companies that featured using this article link.